It’s like nails scraping across a chalkboard. You’re out for a drive on a nice day with your windows down, and a car pulls up next to you at a stoplight with brakes squealing their awful squeaks. Squeaky brakes are a fairly common occurrence in cars, but they’re still annoying. Not only that, they may be an indicator that something is wrong with your brakes, and it’s time to have them checked out. Squeaky brakes can be caused by any number of things. If your car is relatively new, and the brakes are squeaking, there’s a good possibility that it’s brake dust. As brake pads wear, they produce a dust that sticks to the rotor and can cause squeaking when you step on the brake. Because brake pads wear down over time, they eventually need to be replaced. As a way to help you know when to replace them, they come built in with a “warning tab,” small metal strips that rub against the rotor, causing the squeak. It’s an early warning sign that you should look into having your brakes replaced soon. If the squeak sounds like it’s metal-to-metal, then you may have a bigger problem. Metal-to-metal squeaking is usually the result of ignoring the warning squeak for too long. In any case, it’s an indicator of brakes that need replaced, and soon. It typically means you’ll need to have new pads, rotors, shoes, and drums, and those things don’t run cheap. Calipers are designed to push the brake shoes against the rotors. It’s this that brings the car to a halt. Dysfunctional calipers can mean the shoes aren’t pressed evenly against the rotors, which can lead to squeaking. 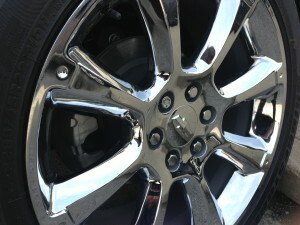 Rotors are smooth and flat so calipers easily grasp them. If your rotors have become rough, pitted, or otherwise misshapen, it creates an uneven surface for the pads to grasp. This uneven surface can lead to squeaky brakes. Sometimes water or oil from the road or from another system in your car can get on your brakes. If it’s on the outside, your brakes will likely dry pretty quickly. If it’s inside, it could take it a while. If the problem lasts for too long, make sure to take it in. You don’t want to be careless with your brakes. If you have any fears that your brakes may be wearing down, take your car to a mechanic and have them checked out. Brakes can be pricey, but special deals like these can help you bring down the cost. Posted in Brakes, Maintenance and tagged Automotive, Brakes, Indiana, Indianapolis.